Whatever term you choose to use – and President Benson used them all as he shared his ambitious vision at a public forum on Tuesday, June 30 – it is clear that EKU is the midst of a radical transformation not seen since the Robert R. Martin administration of 1960-76. 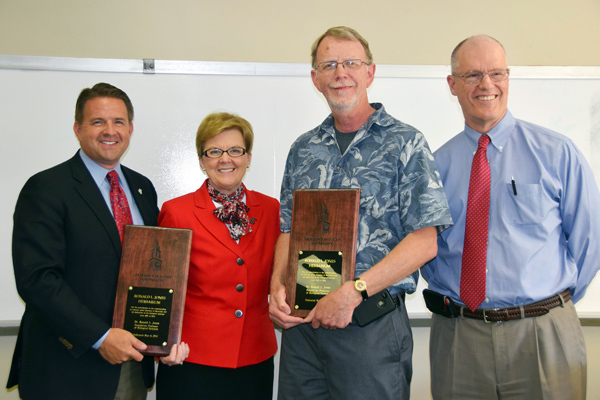 From left, President Benson, Provost Janna Vice, Dr. Ron Jones, and College of Arts and Sciences Dean Dr. John Wade were on hand for the plaque presentation. His persistent efforts as its long-time curator made the EKU Herbarium one of the largest and most diverse in the region. His groundbreaking book, “Plant Life of Kentucky,” earned raves nationally and will serve botanists and the public for years to come. And now the name of Dr. Ronald L. Jones will grace the EKU Herbarium. Shortly after the University’s Board of Regents approved naming the facility for the long-time biology professor, colleagues past and present as well as family members were on hand for a plaque presentation at Jones’ retirement ceremony. Dr. Doug Whitlock’s love affair with EKU Athletics has come full circle. The EKU president emeritus first began following Eastern sports teams and the Ohio Valley Conference as a teen growing up in Richmond. He went on to spend most of his adult life on the Eastern campus – first as a student who earned two degrees and then throughout a distinguished administrative career that spanned parts of six decades, culminating in the EKU presidency 2007-13. To this day, he remains among the Colonels’ most avid supporters, a fixture at campus sporting events, and boasts an encyclopedic knowledge of the teams and countless student-athletes who have donned the maroon and white. On May 29 in Nashville, Whitlock joined two others as the newest inductees in the OVC Hall of Fame. Eastern didn’t have to look far to find a dean with the personal reputation to match its internationally renowned College of Justice & Safety. Dr. Victor Kappeler, an associate dean of the College since 2012 and a widely recognized scholar whose textbooks are commonly used by universities worldwide, succeeded Dr. Allen Ault, who retired June 30 after serving 12 years in the position. Edwin Thompson, who in the last five seasons has recruited and coached 11 All-Americans and 24 players who went on to play professional baseball, has been chosen as the new head baseball coach at EKU. In addition to teaching algebra and mathematical applications to students, Eastern professor Dr. Antoinette Davis wants to inspire people of all ages to greater educational attainment. Davis is a lecturer in the University’s Department of Mathematics and Statistics and has also written four books, including her most recent, “Achieving the Ultimate Dream of Education,” which was published in May. Dr. Melinda Wilder, director of natural areas at Eastern, recently received the Lifetime Achievement Award from the Kentucky Association for Environmental Education (KAEE). Dr. Tanlee Wasson was recently named assistant vice president for institutional effectiveness and institutional research at EKU. As both a player and an assistant coach at EKU, Austin Newton played a key role on some of the most successful men’s basketball teams in the history of the University. Now, in a new role focused on the EKU Athletics Annual Fund and the Colonel Club, Newton will take on the challenge of securing private support to help the University’s entire athletics program reach new heights of excellence. Ian Mooers, director of the Center for Economic Development, Entrepreneurship and Technology (CEDET) at EKU, has been appointed to the East Kentucky Workforce Innovation Board (EKWIB). 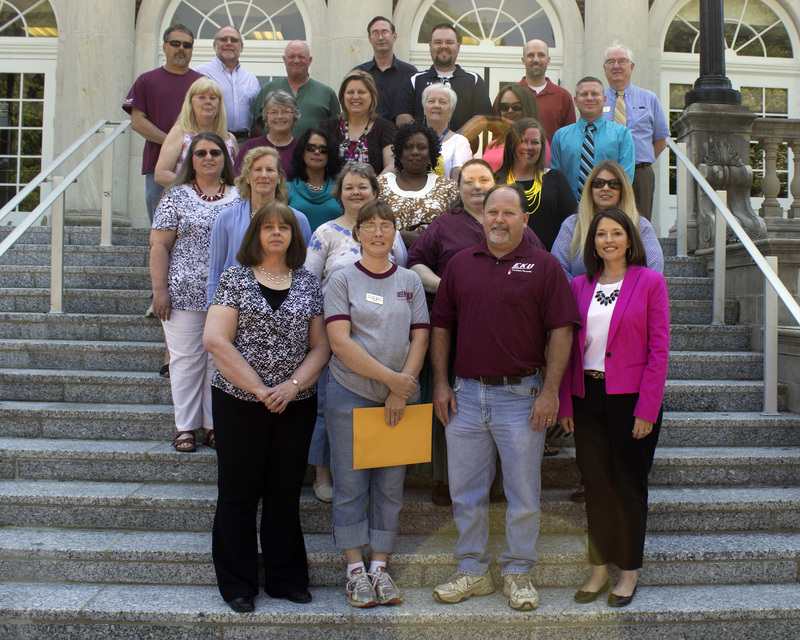 Melinda Wilder, director of the Division of Natural Areas, and Billy Bennett, director of the EKU Center for Environmental Education were certified as master environmental educators at a ceremony in Frankfort on May 14. The EKU Board of Regents, meeting in regular session on June 22, approved a new Strategic Plan for the University. The honors keep coming for Model Laboratory High School. According to the research site Niche, Model Lab is the third best public high school in Kentucky, behind only DuPont Manual High School in Louisville and Highlands High School in Fort Thomas. Last fall, Newsweek magazine ranked Model, located on the campus of Eastern Kentucky University, among the top 1 percent of the nation’s public high schools. The evening started with a rainbow that arced perfectly behind the commencement stage. And it ended with a fireworks display in the night skies above Richmond. EKU exceeds similar benchmark institutions and other comparison groups on several measures related to student engagement. According to the 2014 National Survey of Student Engagement (NSSE), EKU seniors ranked the University especially high on effective teaching practices, quality of interactions, and two areas related to level of academic challenge: higher-order learning and quantitative reasoning. In fact, Eastern scored ahead of its benchmarks, national norms and southeast public universities in all those categories except quantitative reasoning, where it eclipsed its benchmarks and national average. 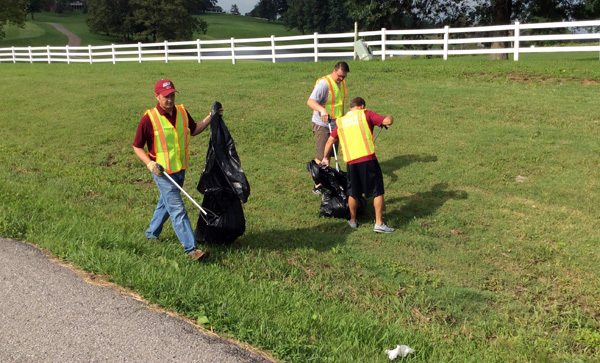 Seniors also ranked EKU ahead of its benchmarks in supportive environment. Students in Perry County will be taught where their food comes from and encouraged to begin a healthy lifestyle at a young age. High school students in Wayne and Pulaski counties will be educated about mental illness and mental health. Estill County Emergency Medical Services will develop a coordinated multi-tiered safety plan for preventing school violence and disruption and for responding to school violence and disruption when it occurs. Students in four school districts in Whitley and Knox counties will be exposed to the arts through a variety of course options and opportunities. Local community members from Harlan, Letcher and surrounding counties will engage in citizen science projects, such as monitoring lichens as a bio indicator of air quality, creating a sense of ownership and empowerment. 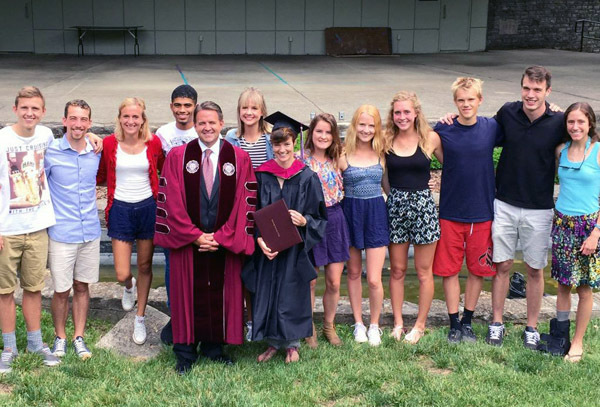 Approximately 20 EKU representatives, including President Benson and other top administrators, fanned out along the West Main Street corridor of Richmond the morning of July 7. 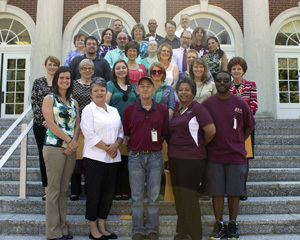 Twenty members of the EKU faculty were selected as 2014-15 Critical Thinking Teachers of the Year. 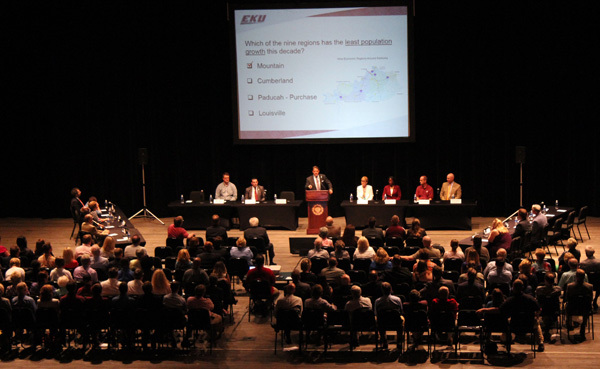 EKU won the Ohio Valley Conference Commissioner's Cup for the 2014-15 school year the league office announced on May 26. 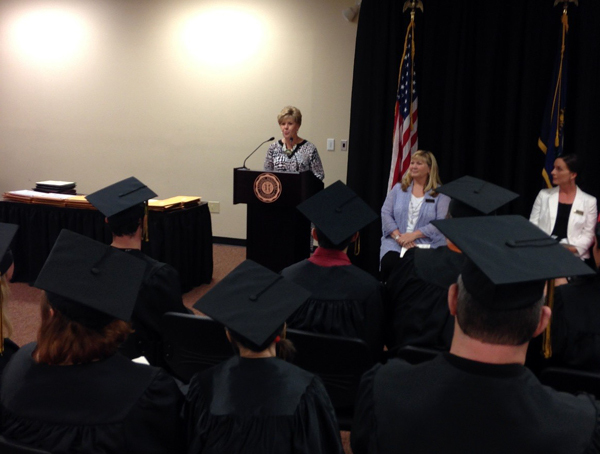 The EKU Adult Education Program recognized 75 graduates from Clay, Garrard and Madison counties in a ceremony on May 12 at the Perkins Building featuring State Rep. Rita Smart as the keynote speaker. During the past year, 34 students completed their GED and 30 students successfully completed the Kentucky Paraeducator Certification. Eleven students from Madison County also earned a National Career Ready Certification (NCRC) from the EKU Adult Education Program. The “wow” is back at Eastern’s Hummel Planetarium. Recent equipment upgrades have made the 27-year-old facility an even more attractive option for campus uses, for school groups from around the region, and to the public. Grand re-opening ceremonies were held at the planetarium May 21. Featured speakers were State Rep. Rita Smart, Kentucky Commissioner of Tourism Mike Mangeot and Dr. Anthony Blose, chair of EKU's Department of Physics and Astronomy. The EKU Center for the Arts will host another Kentucky gubernatorial debate this fall. Last winter, he shoveled nearly a foot of snow off a student’s driveway in Berea after that student challenged him on Twitter to make it possible for him to attend class the next morning. On May 17, President Benson took time to preside at a one-person commencement ceremony, again due to a Twitter request from a student. It’s hard to say who was more exhausted after the whirlwind of May 15-16: Una Britton, who had just competed in the OVC track and field championships, where she topped all competitors in the 10,000-meter final; or Benson, who had presided over or participated in five commencement ceremonies the previous two days. It might take the entire stage at the EKU Center for the Arts just to hold all the awards won by the performers who’ll grace it in the Center’s fifth season. 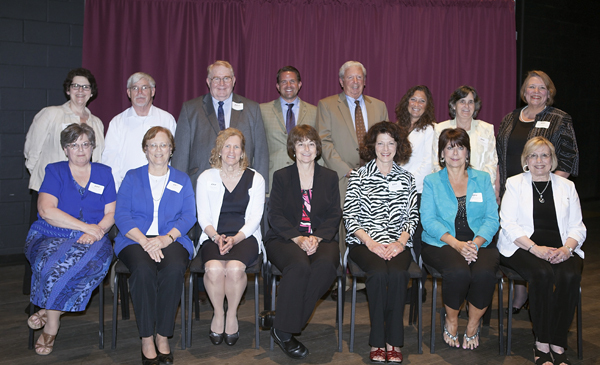 Eastern honored this year's retirees at a campus banquet in May. The honorees, pictured with President Benson, included: front row, from left, Regina Fultz, Mary Swelnis, Vicki Rowe, Joy Renfro, Dolores Marken, Mary Brown-Davis, Judy Short; back row, from left, Clemms Snider, Ted Lloyd, Marlow Marchant, Allen Ault, Stacey Street, Rose Pennington and Peggy Tudor. 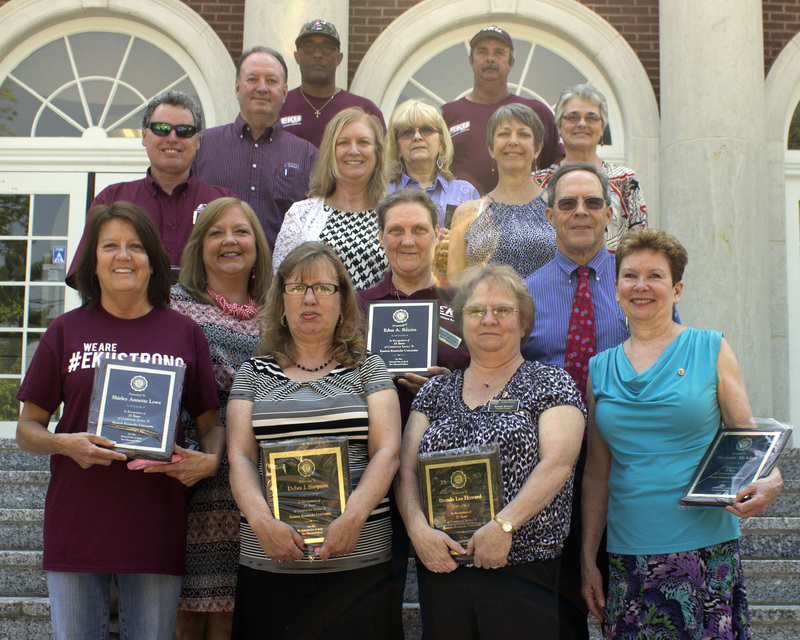 Employees celebrating 5, 10, 15, 20, 25, 30, 35, 40 and 45 years of employment were recognized during a May 7 luncheon on the Blanton House Lawn. Click Image for Larger Photo. Right Click Larger Image to Save Photo. 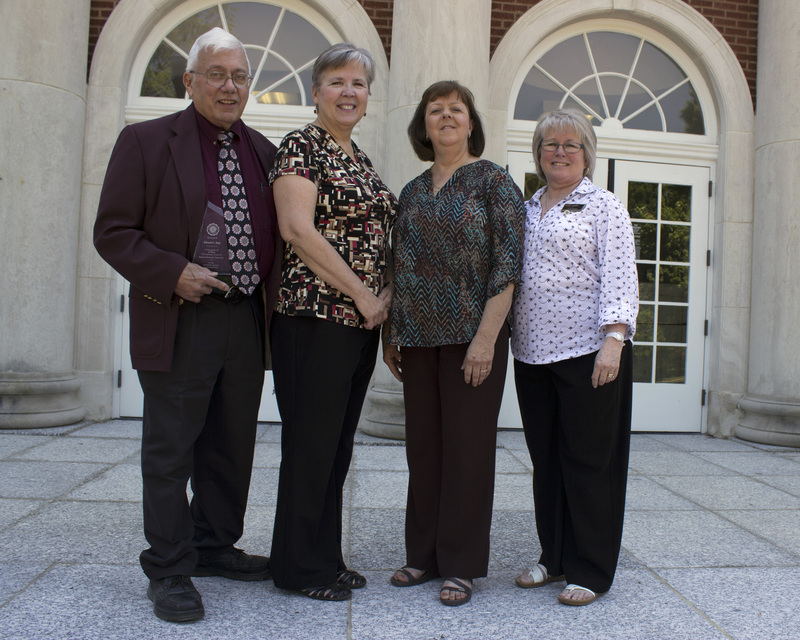 30-, 35-, 40- and 45-YEAR EKU EMPLOYEES – From left are Carroll Hale (45), Susan Kipp (30), Betty Parke (30) and Carol Thomas (35). Others 30 years and up not present for photo: Bob Brubaker, Stu Johnson, Homer Strong, Linda Wimberly, 30; William Davis, Rick Erdmann, Gary Ritchison, 35; and William Nixon, 40. 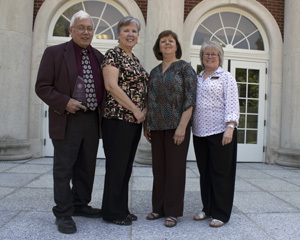 25-YEAR EKU EMPLOYEES – Front row, from left, are Shirley Lowe, Debra Simpson, Brenda Howard and Marianne McAdam. Second row, from left, Kenna Middleton, Edna Renfro and David Dailey. Third row: David Williams, Pat Woods and Pamela Blackburn. Fourth row, from left, Tom Schneid, Sonia Smith and Barbara Howard. Back row, William Way, left, and Donald Alexander. 20-YEAR EKU EMPLOYEES – Front row, from left, Beverly Hisel, Stephanie King, Madonna Cain and Jennifer Evans. Second row, from left, Colleen Schneck, Ann Cotton and Anita Foster. Third row, from left, Cathy Robertson, Michalle Rice, Amy Eades and Robin Sparks. Back row, from left, Theresa Jackson, Greg Moberly, James Clark, Elmer Beckler and Adrian Nix. 15-YEAR EKU EMPLOYEES – Front row, from left, Jean Arthur, Christina Wilburn, Glen Adams and Shelia Adams. Second row, from left, Vicki Rowe, Donna Ricketts, Stacia Cook-McCoy and Michelle Mouyeos. Third row, from left, Robin Wicker, Debra Walter, Josephine Martin and Laura Hollingsworth. 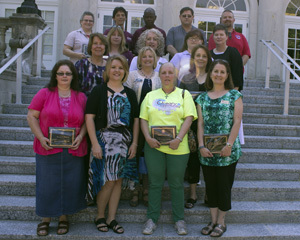 Fourth row, from left, Beverly Dyehouse, Glenda Poynter, Kim Tate, Sue Keeton, Kristine Smith and Billy Martin. Back row, from left, Timothy Wiseman, Richard Tussey, William Staddon, Kyle McQueen, Ryan Baggett, William Beam and Anthony Adams. 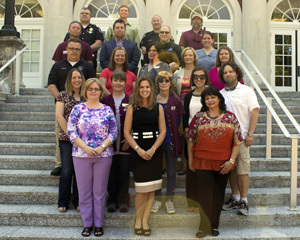 10-YEAR EKU EMPLOYEES – Front row, from left, Brenda Gray, Kathy Mounts and Debbie Zabawa. Second row, from left, Jamie Haddix, Brigitte Causey, Belinda Begley, Jessica Gernert and Michael McGaffey. Third row, from left, Patrick Begley, Debra Sparks, Amy Coates, Janet Alexander and Debbie Sowers. Fourth row, from left, Shon White, Ronnie Nolan, Gary Folckemer and Kelly Smith. Back row, from left, Brian Mullins, Mark Howard, Brad Early and Thomas Britz. 5-YEAR EKU EMPLOYEES – Front row, from left, Elizabeth Keith, Teresa Pasley, Walter Davis, Patti Matthews and Marcus Walker. Second row, from left, Angela Madden, Karen Maloley, Krista Rhodus, Heather Beirne, Kathy Willis and Rella Evans. Third row, from left, William Gulley, Sheila Lippman, Tara Hart-Burhoop and Barsha Rogers. Fourth row, from left, Elizabeth Potter, Christoper Duckworth, Mary Lamar, Jerome May and Constance Sumner. Fifth row, from left, Jennifer Strauel, Patty Sallee, Thomas Parker and Mary Sheets. Back row, from left, Derek Krunchyk, George Gallien and Brett Morris.